Good news: I’ve made more progress on my breakfast nook makeover! Per my inspiration, I knew that I wanted a little gallery wall of three black-framed pieces. But I didn’t quite know what kind of art I wanted. Original art is usually pretty expensive, and although there are great sites selling affordable prints, I’m impatient, and wanted instant art. With a little digging, I managed to find some art that I’m really happy with, and discovered a new source of free printable art in the process. First I ransacked my closets for frames I could reuse. We have a bunch of frames sitting around, left over from previous places we’ve lived, or with art that we no longer want to display. I looked for black ones with frame molding about 3/4″ wide, but considered other colors because I knew I could always break out the black spray paint. I found two that would work, and laid them out on the floor to find a layout that I liked. At that point I realized I wanted a square one, which was surprisingly hard to find in the exact size I wanted. Eventually I tracked this one down, which is a little larger than I would prefer, but gets the job done, and is a whole lot less expensive than a custom frame would be. To make sure my layout would work on my wall, I traced the frames on brown paper (actually a paper bag I unfolded, cut up, and pieced back together), and cut out the outlines. I used painters tape to stick the paper outlines to the wall. If you’re hanging a gallery wall, I highly recommend this method, because when you’re satisfied with the layout, you can measure where the hangers need to go, and put nails right through the templates before you take them down. Frames picked out, it was time to move on to the art. We’ve had this “Eat It,” piece for a long time (but it still makes me laugh! ), and I knew I wanted to put it back up. We bought it years ago, maybe from a library sale, and I think it’s actually a cutout from an old book. To refresh it, I switched out the black backing paper for white, and put it in a more closely-cropped square frame. But that still left two more frames that I needed art for. So I turned to some of the free art sources that I’ve shared in the past. Unsplash is one of my go-tos for all kinds of photos, but I wasn’t quite sure what I wanted. I thought maybe something abstract would work, so I searched “marbled,” and ended up finding some really cool photographs. Can you tell what this one is? 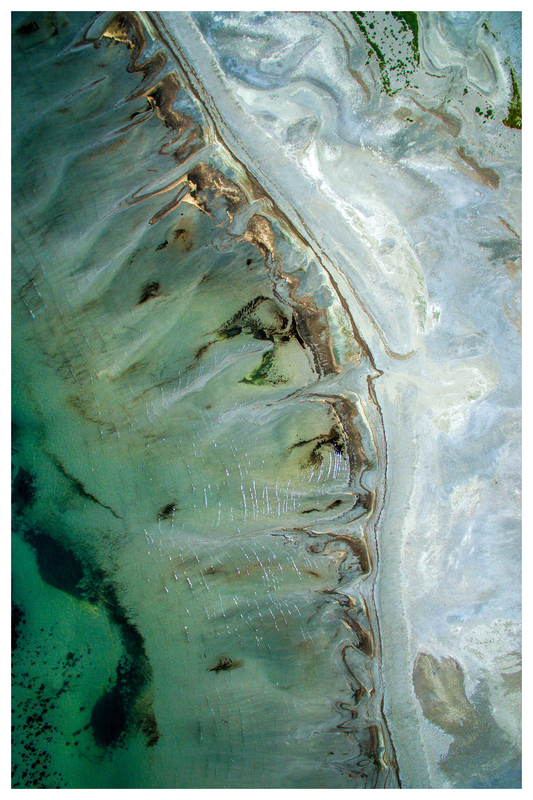 It’s an aerial photograph of the Great Salt Lake. That’s my cropped version that I resized to fit my 12×18 frame with a white border (click for the BIG printable file), but you can see the original by Matt Howard here. There is a bunch of other gorgeous aerial photography, too. For the last piece, I used art from a new-to-me source of free printable art, the Rijksmuseum and their Rijkstudio. It’s filled with beautiful Old World rights-free art. I can’t remember which blog I saw it on, but a while ago I saw a project where someone covered a couch in floral fabric that they had printed with art from the Rijksmuseum. Lana Red reminded me of it when she recently did a similar project with an Ikea couch. So I browsed through their digitized art, and I found this vintage cat sketch that I thought went perfectly with the other pieces. I love how it coordinates with the “Eat It” piece, and since our cats’ food dishes are in this room, it is extra fitting for this wall. If you’re printing your own art, you do want to use a high-end printer and good paper. My go-to paper for printing art is Epson matte paper in standard 8.5×11 size, or the larger 13×19 size for bigger prints. It’s not cheap, but it makes really nice art prints. I also added another piece to this space, the wall basket/disc. We literally found it on a sidewalk free pile in our neighborhood a few years ago, and I think it fits this spot really well. My original plan, though, was to add a natural element by turning a basket into a light cover. But obviously with this on the wall, that would be basket overload. So I’m trying to find a different light shade. I bought the one you see below from Rejuvenation, but it’s too small, so I am going to return it. I’ve already ordered this one instead. Fingers crossed that it works better for this space! My list of breakfast nook elements to add only has a few items left now. The cushions are going to be the biggest challenge, because I’m still not sure how to solve the issue of needing more back padding, while also needing to be able to easily access the storage beneath the benches. If you have any ideas for me, I’d love to hear them! New light – I’m not sure if the copper shade works in the room I’m picturing, but I’m loathe to buy a whole new light. I have some ideas on a DIY way to make this one work for what I have in mind! New plan: Ordered a white shade cover.